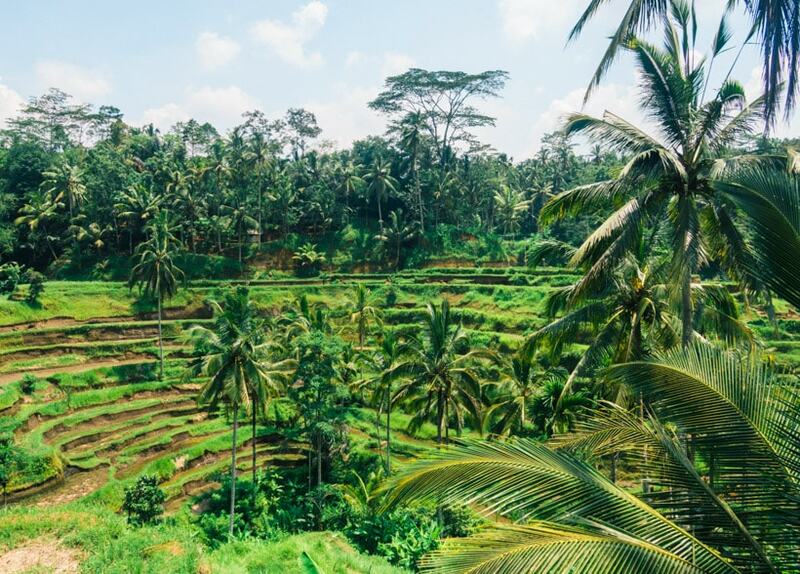 Lush green rice fields, beautiful handicrafts and healthy, spiritual living, that’s what Ubud is all about. 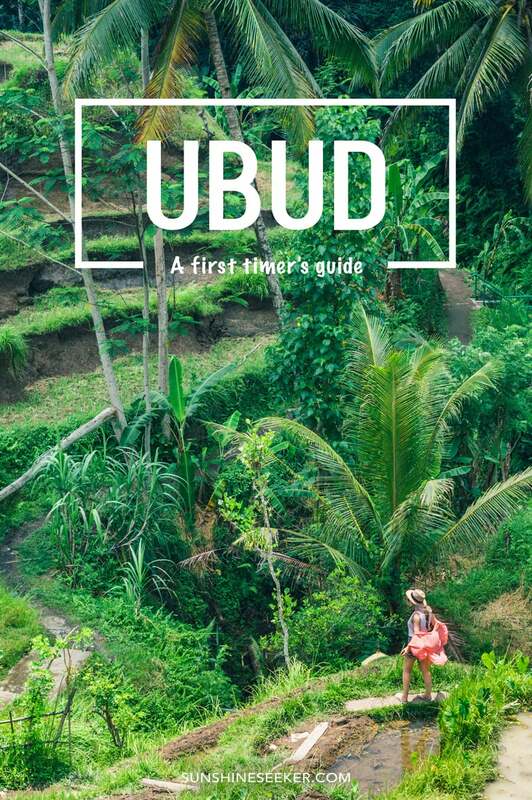 I wrote a little introduction to Ubud in the Bali overview, but as the area is rising in popularity I thought I’d do a more in-depth guide. The little town known to many as the spiritual center of Bali is located right in the heart of the island, around an hour’s drive from Denpasar airport. 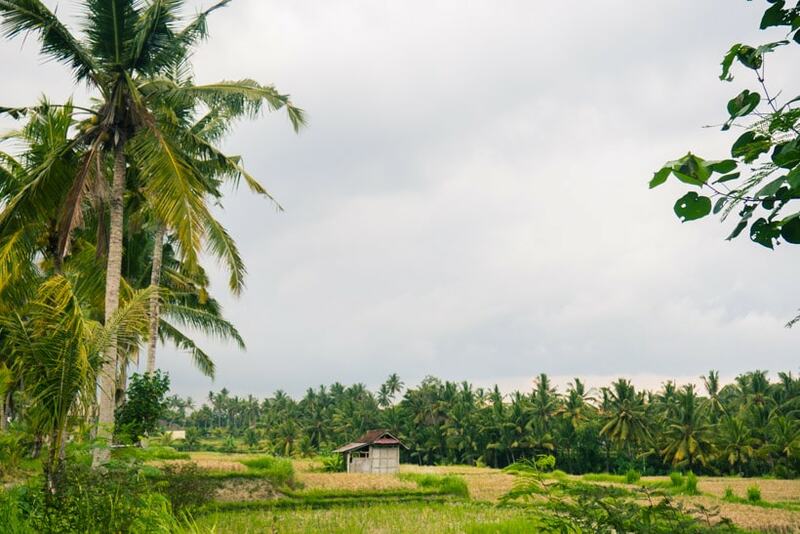 The area surrounding Ubud is lush, green and rich with cultural heritage. Traditional Balinese craftsmen, with skills passed down through generations, call these parts home. Woodcarvers, painters, silversmiths, mask makers and other artisans can be found in Ubud and the surrounding villages. The passion and love for their art and culture are what makes this part of the island so special. Central Ubud is made up of one very busy one-way road, lined with shops and restaurants and people everywhere. 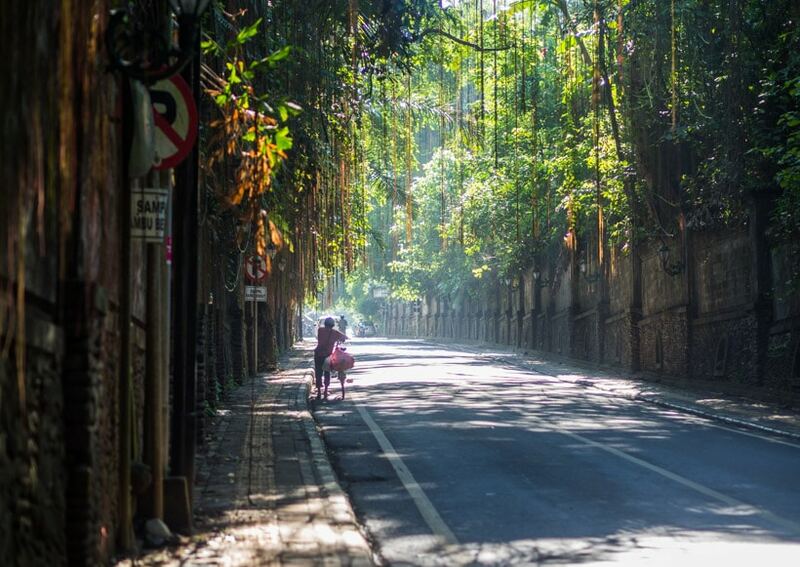 At the south end, you’ll find the Sacred Monkey Forest and at the north end along Jl. Raya Ubud the Royal Palace and Ubud Market. Along this one way road called Jl. Monkey Forest and on roads that run off it and parallel to is where you’ll find most restaurants and cafés. 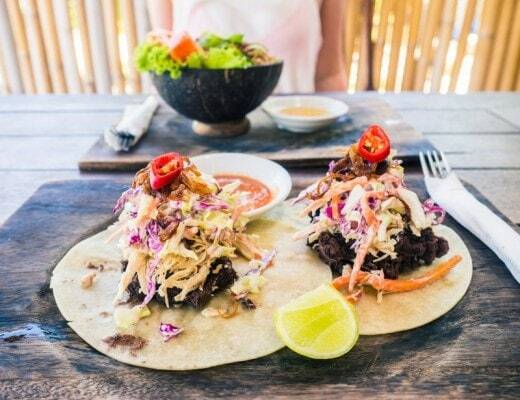 Ubud really is a haven for vegetarians and vegans, as meat-free options are available everywhere. Try out popular spots like Alchemy, Locavore, Clear Cafe, Melting Wok Warung and Seeds of life. For a quick and cheap meal check out the street vendors. I especially like the guy selling spring rolls and other fried goodies on Jl. Monkey Forest, you can’t beat a 10k Rp. / 6 kr / $.75 meal. Where you’d want to stay while in Ubud depends on how much time you have to spend in the area. If you only have a couple of days, I would stay in a homestay in one of the smaller roads off of Monkey Forest Road. That way you can walk to a lot of attractions and restaurants while getting a taste of real Balinese life from the family you’re staying with. In the photo below you can see us having breakfast on the balcony of our homestay, Jawi House & Painter, which we found on Airbnb. We had a great time there much thanks to our host Putu. She arranged drivers, motorbikes, sarongs for the temples and even bought us a traditional Balinese meal on our last day. 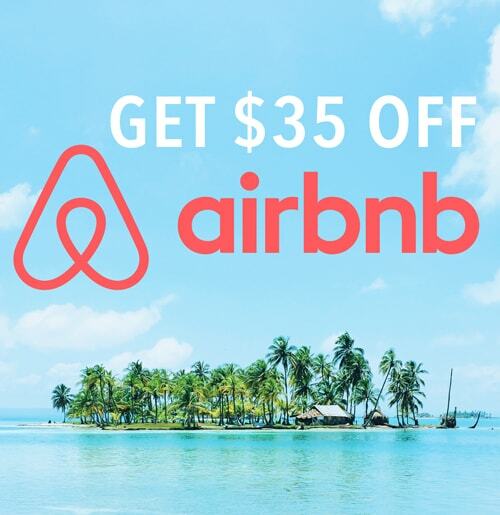 Remember to claim your $40 Airbnb discount here! If you have some more time I would suggest staying in a villa up in Penestanan, which is a little village about 20 minutes walk out of Ubud town. Penestanan is known as a quiet artists community and is popular with expats and digital nomads. It’s the perfect place from which to explore all the beauty the area has to offer. 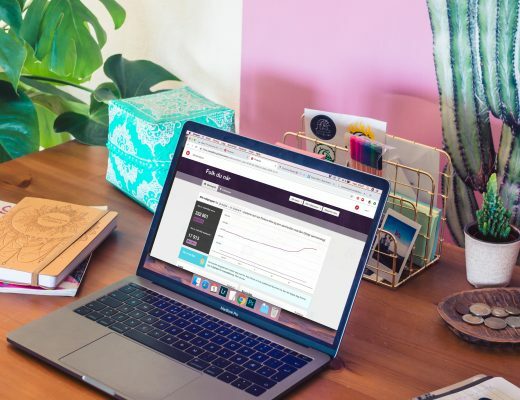 If you’re looking for budget hotels, check out Agoda. I almost exclusively book hotels through their site whenever I’m in Southeast Asia, as some of the cheapest places are only listed on there. One of my favorite budget hotels in Penestanan is Gerebig Bungalows. The gardens and pool area are gorgeously green, with pathways leading through a rice field. Here you’ll experience the true Ubud feeling of peace and serenity. For about $30 you get a double room with garden view, free breakfast and wifi. Now that’s what I call a great deal! On the other side of town, the incredibly stunning Green Bird Villas are definitely worth checking out! A superior double will only set you back about $50 and that includes free breakfast, wifi, TV, AC ++ If you add another $20 you’ll get the deluxe room with a large bathroom and view of the awesome pool. The prices I mention will, of course, depend on the time of your visit. I always try to travel during low season to get the best rates available and a lot fewer tourists. 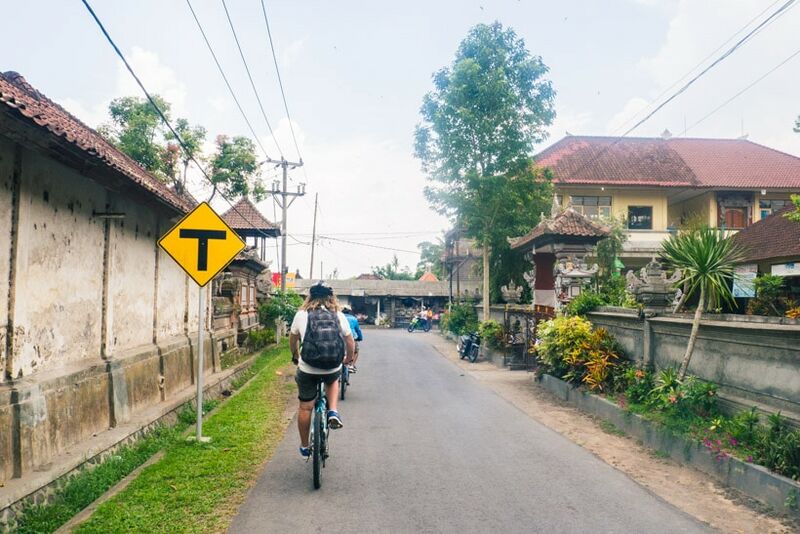 The most efficient way to get around Ubud is to hire a motorbike for around 50k – 70k Rp. / $3-4 a day. Ubud and the surrounding area is one of the places in Bali I feel totally safe driving by myself. The roads are good and there is so much to see that you will miss if you go by car. If you work remotely or for yourself, there’s no better place to be than Bali. Ubud has long been the co-working capital of the island with creatives from all over flocking to spaces like Hubud and Outpost. Wouldn’t it be nice to see a pool and palm trees out the office window? And if you get a little tense from all the work, just order a healthy juice or fresh coconut and an on-site massage. That sounds like heaven to me! With rates starting at $12 a day for a working space with high-speed wifi, it should be doable for most. Hubud also offers a “Soft Landing” package if you want to relocate to Bali, but don’t really know where to start. 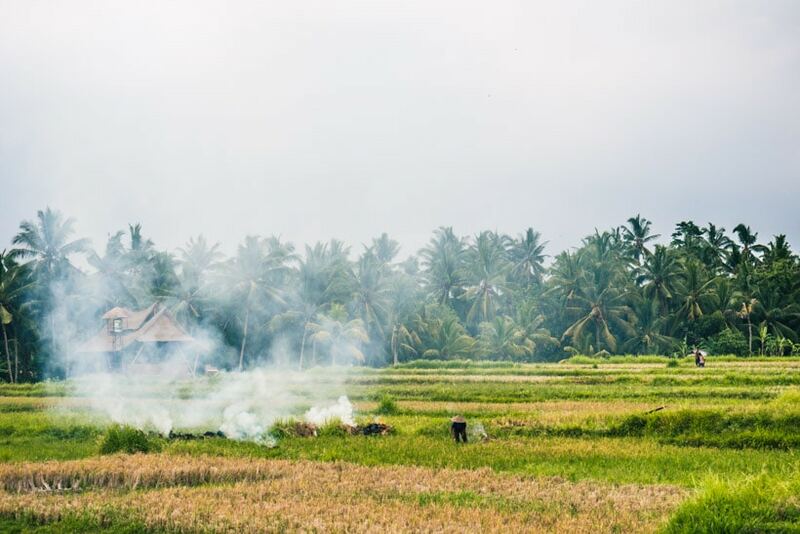 If you’re thinking of going to Ubud, be sure to check out this awesome tour which I’ve heard so many great things about. 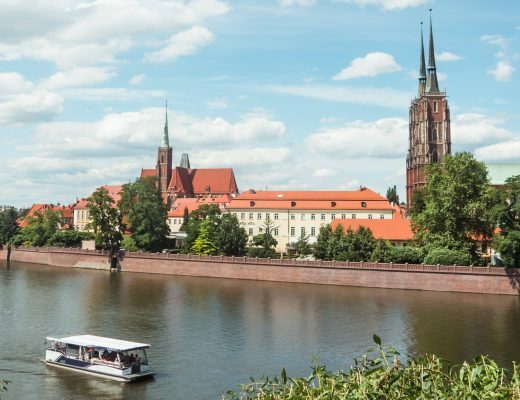 The 7-day itinerary will not only immerse you in local life but also work on your mind, body and soul! 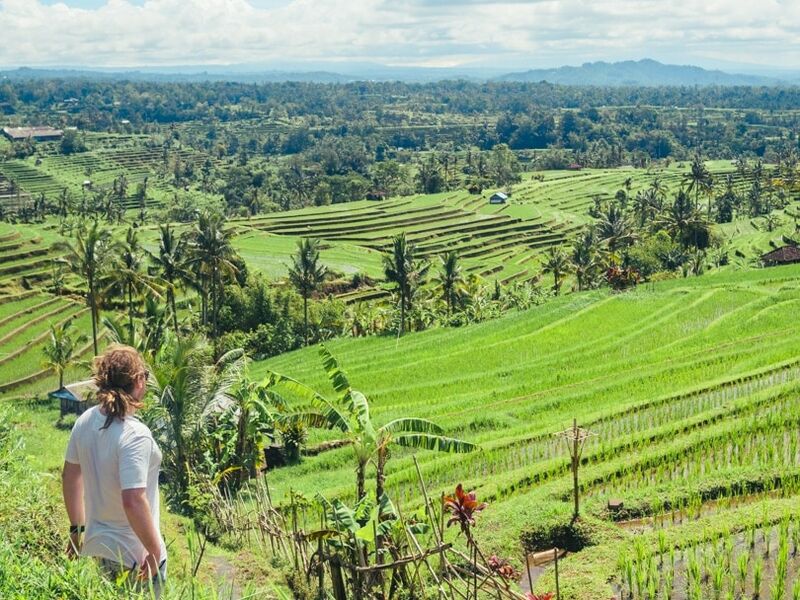 A morning or afternoon stroll on the Campuhan Ridge Walk is a definite must while in Ubud. It’s free, you get a workout and some of the best photo ops on the island, all in the most amazing setting. Think lush green rolling hills with the odd palm tree and yellow butterflies flying everywhere. The only downside is that it gets incredibly hot during the day, so I would recommend going as early as you can manage, maybe before breakfast? It’s the perfect way to start the day. You’ll find the starting point of the walk to the left of the entrance to Warwick Ibah Luxury Villas and Spa, just follow the path over the bridge and past the temple. Can you believe this place exists just off the busy Jalan Raya Ubud? Ok, it might look a little grey and gloomy in these photos, but we visited in the midsts of the rainy season in the afternoon. Blink once and you will miss the old sign saying “Subak Juwuk Manis (Rice Field) Ubud” pointing down an alley. Follow the path until you think you shouldn’t go any further because it looks a bit sketchy, then keep going past an abandoned house and you will soon see green everywhere. We didn’t encounter many other tourists on this walk, just some ducks and a couple of workers. A tip is to pop in on your way back to town from the Campuhan Ridge Walk. 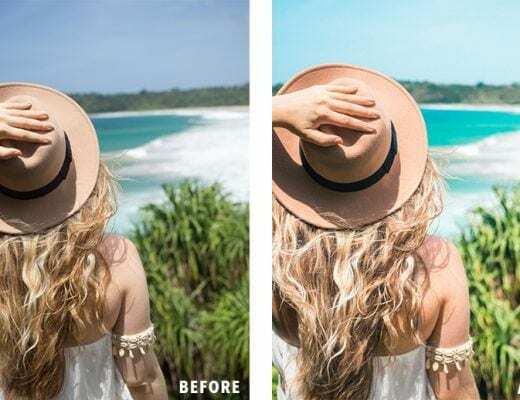 If you’ve seen any photos from Ubud, chances are it’s of the Tegalalang Rice Terraces. Along with the Sacred Monkey Forest Tegalalang is the most iconic of all the attractions in the area, maybe also in Bali. That means everyone wants to get a glimpse of it, so it gets extremely crowded. I would recommend visiting early in the morning or later in the afternoon to escape both the crowds and the midday heat. 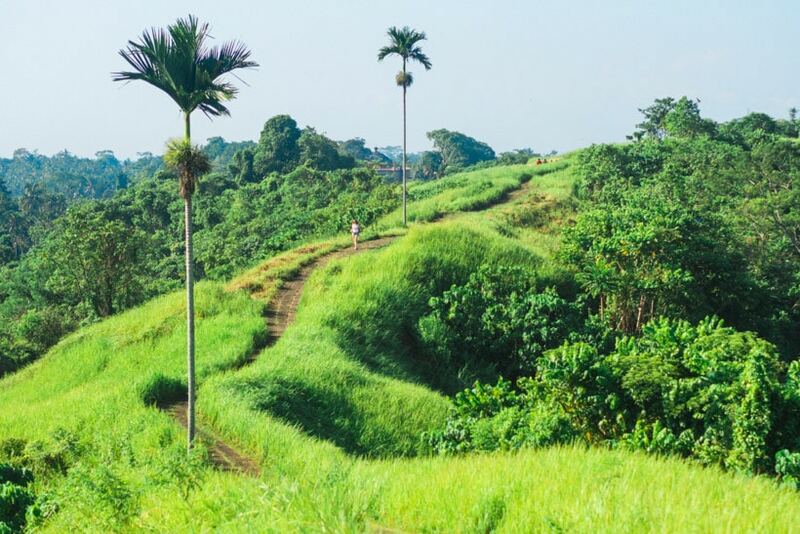 From the top of the road, you get stunning panoramic views of the terraces, which is really an irrigation system called Subak dating back to the 8th century. Be sure to not only settle for the view, venture deep into the jungle to take in and appreciate this ancient form of engineering. The drive up from central Ubud takes about 20 minutes and is mostly straightforward, so even if you’re not the most experienced on a motorbike you should be fine. 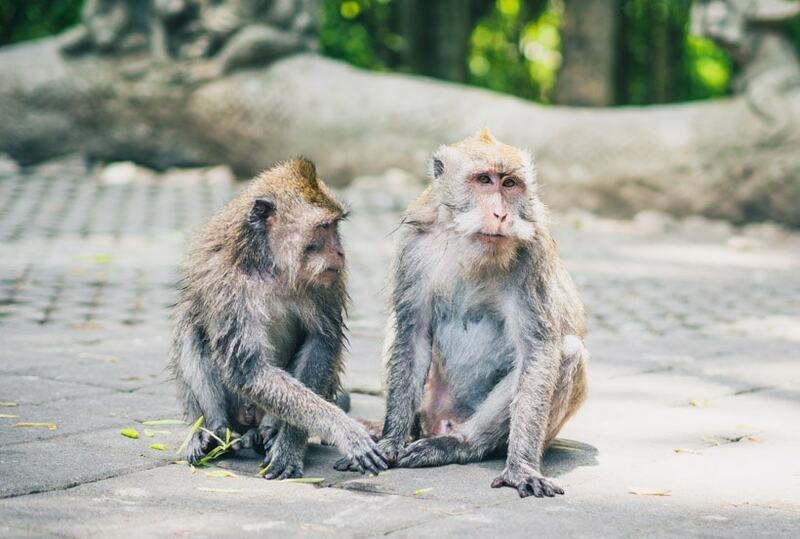 As I’ve had my share of monkey encounters at the monkey temple down in Uluwatu, I didn’t expect much when we headed to the Sacred Monkey Forest Sanctuary in Ubud. But wow was I in for a surprise, this place is so much more than just the monkeys. It really felt like we stepped into an enchanted forest. With 115 different species of trees and three temples dating back to the 14th century, the complex is huge, so be sure to explore every nook and cranny to get the most out of your visit. Don’t bring anything into the forest other than your camera, as the monkeys will steal it. I’ve seen the sneaky little creatures open backpacks, take sandals off the feet of grown men and keys out of people’s pockets. 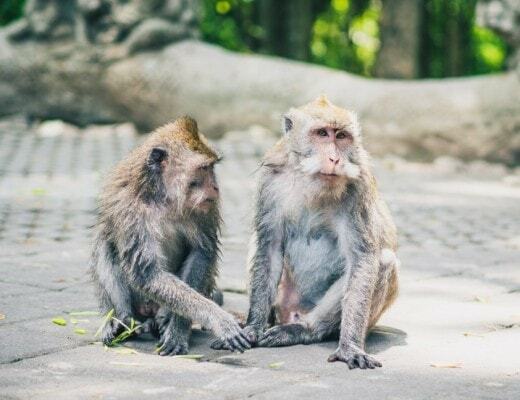 As a number of people visiting the forest continue to increase, about 10 000 people a month as of now, so does the aggressive behavior of the monkeys. If you bring any food or buy the bananas being sold in the forest they will attack you until they’re sure they’ve got everything. Don’t try to hide it under your clothes, trust me they’ill find it. Sometimes you’ll be fine and get some great photos but sometimes people get bitten. I’ve seen a few bloody hands and legs around the island, so remember to be careful and use common sense. We opted to drive our motorbikes straight from Tegalalang to Tegenungan Waterfall, which ended up taking a bit longer than we first anticipated. We got lost a couple of times, but don’t worry if you do, just stop and ask the locals and they will point you in the right direction. The drive from central Ubud is supposed to take around 25 minutes. When we finally got there I was shocked by a number of people, is this what low season looks like? I don’t know why but I had built it up in my head to be this secret spot deep in the jungle where I could splash around in the water all by myself. But I guess the secret is out, you’ll find small warungs and stalls selling souvenirs just like at any other of Bali’s attractions. Still a beautiful place well worth a visit. Remember to bring your bathers as the water is clean and safe to swim in. The best time to get a good photo is in the afternoon when the sun is low and the crowds head back to town. Entrance is 10k Rp. / 6kr / $0.75. 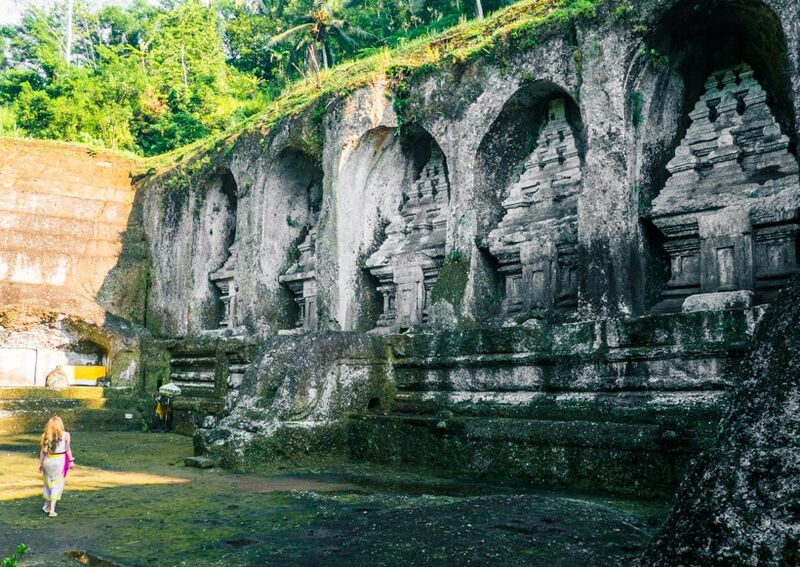 Goa Gajah or the Elephant Cave if you will, is located an easy 10-minute drive southeast of Ubud. Some say it was built during the 11th century as a place for meditation and some say it dates back to as early as the 9th century. You enter the t-shaped cave through the mouth of a demon and inside you’ll find different stone carvings and shrines. Outside in the courtyard, there’s a holy pond with six Hindu angels, where worshippers will rinse off and purify themselves. The temple isn’t among the grandest on the island, but it’s still a fun place to visit and it’s easily reached from central Ubud. It’s open every day from 8am – 4pm, tickets are 15k Rp. / 10 kr / $1. The majestic Gunung Kawi lies at the bottom of a lush green valley in the Tampaksiring area, 40 minutes northeast of Ubud. The funeral complex, consisting of 10 shrines each 7 meters tall, is thought to be dedicated to an 11th-century royal family. Opening hours are 7am – 6pm and the entrance fee is also 15k Rp. per person, if I remember correctly. I would suggest arriving as they open so you can take in the beauty in peace and quiet as the sun rises. Of all the attractions Bali has to offer, this is my favorite by far. When you’re there all alone it truly feels like a magical place, I could’ve wandered around the stunning grounds for hours and hours. It was hard to decide on which tour operator to choose for or cycling tour in Ubud. After hours on Tripadvisor going through photos and reviews, we landed on the family-owned business Jegeg Bali Cycling. Their small groups (we were only four people) and the price of 45 dollars were the deciding factors. We got picked up at our hotel in the morning and then headed to have breakfast overlooking the spectacular volcanic caldera of Mt. Batur with its deep crater lake. After that, we went to a coffee plantation and then started the cycling part of the day. It was mostly downhill, so you’ll be able to do it even if you’re not in the greatest shape. We felt safe throughout the whole tour as Putu’s uncle would drive ahead and stop traffic for us if necessary. 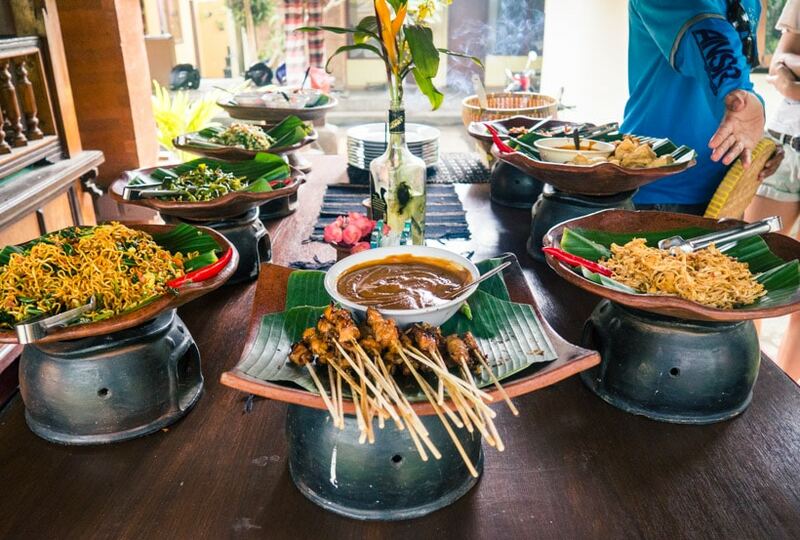 The best part of the whole day was getting to come inside their family compound to enjoy a traditional Balinese meal. I thought I already was quite knowledgeable about Balinese culture, but we learned so much from our guide Putu whom spoke very good English and was happy to explain everything we wanted to know. In the end, we received a gift, a beautiful shirt, made in the neighboring village. Putu explained that since they earned a lot of money from us they wanted to pay it forward and then give something back. Gotta love the Balinese people. One of my best days in Bali so far. 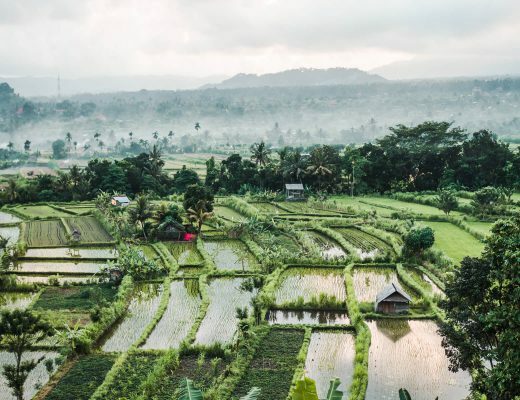 If you want stunning views of lush green rice fields but want to escape the crowds altogether, at least in low season, go see the Jatiluwih Rice Terraces. The UNESCO world heritage site is the largest and most picturesque area covered in rice paddies in all of Bali, maybe even Indonesia. Located one and a half hour northwest of Ubud at the foot of Mount Batukaru, it’s a cool and calm place to experience the “real” Bali. Okay, I know this isn’t technically an Ubud attraction, but Jatiluwih is a great alternative to the extremely crowded Tegalalang. 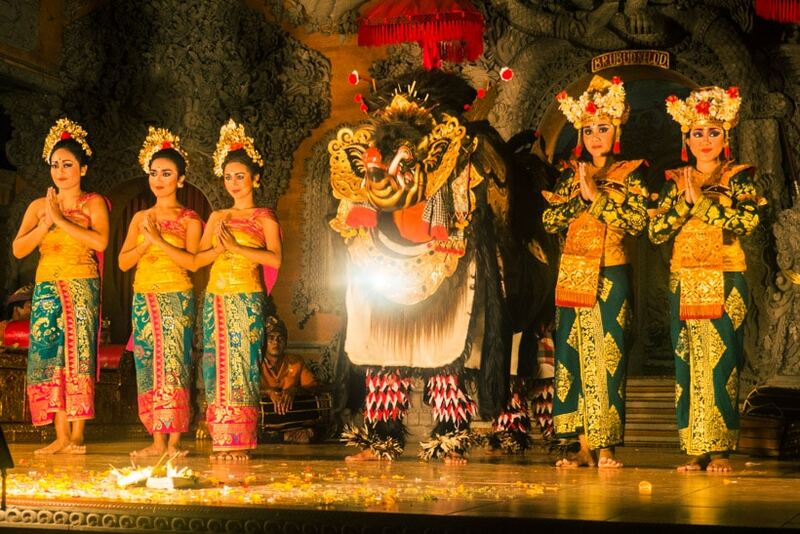 This full-day private tour will take you to Jatiluwih and some gorgeous temples. Be sure to check it out! Southeast Asian food, Indonesian in particular, is at the top of my list when I think of delicious food. Mie Goreng, chicken sate, Lumpia and Tempe, it makes my mouth water just thinking about it. So what can be better than a cooking class where you can learn to make all this yumminess at home? I can recommend this particular one which also includes private transfer and a visit to the morning market. The price is 800k Rp. / $60 per person and last for about 4-5 hours. This is one of the activities you can do during midday when it’s too hot to do anything else. My top 10 choices are only a small selection of everything the area has to offer. Don’t forget to check out the Ubud Market, the different museums, the yoga studios and the traditional dancing like Kecak and Legong. 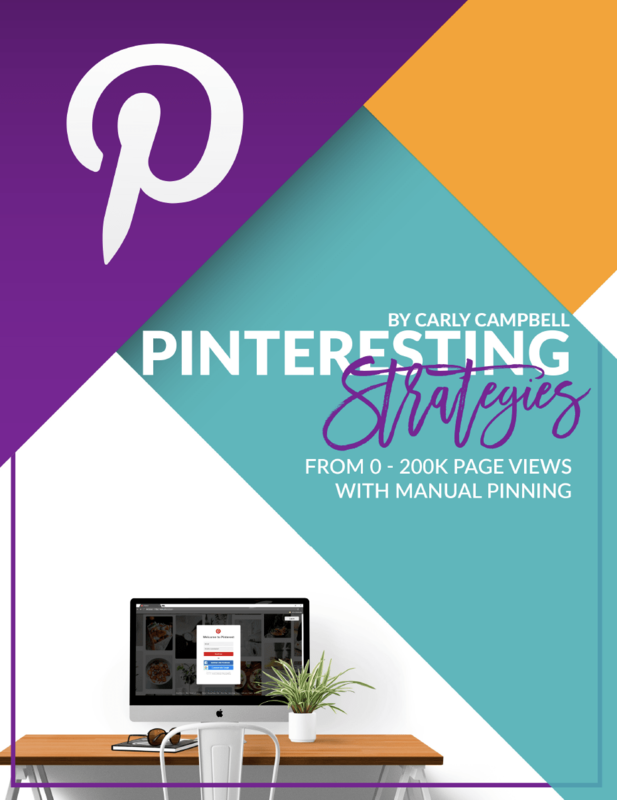 I hope this guide can make your planning a little easier, but if you have more questions feel free to ask! I’ll write in more detail about some of the spots in the next few posts. Omg omg omg! I’ve just discovered your blog and I could cry with how perfect it is! 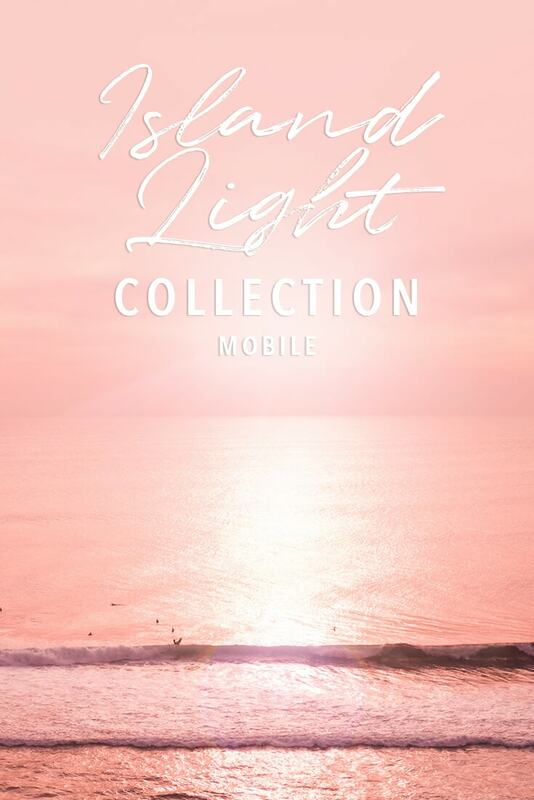 It’s just stunning – your photos are beautiful, the content is amazing! I think you’ve just become my favourite blogger within 10 minutes haha you deserve so much more recognition! This couldn’t have come at a better time for me, as I fly to Ubud tomorrow! And your blog is just a perfect start for me. Love your pictures too, all very inspiring. Look forward to reading more on your site and following your journey. I was wondering whether you give me some details regarding the scooter/motorbike rental such as whether to book in advance (and where) or to find smth directly upon arrival. Or maybe you can mention the company/contact of the place you found yours. Hi Andreea! Thanks for your comment! I always rent a motorbike from my accommodation, that’s just the easiest. Just ask for one when you arrive. Almost all hotels and even homestays have motorbikes for rent. Other that that you’ll find a rental place on every corner, no huge rental companies. Everyone in Bali knows someone who rents out motorbikes 😉 Hope you’ll have a great trip! I love everything about this. I’m going to Bali beginning of November and I have most of this on my list and I can’t wait to experience it all! What did you wear throughout your trip? I’m concerned about the bugs and am thinking yoga pants or something but I don’t want to be hot all the time. Any suggestions? How fun! You’re gonna to have such a great time! During the day I always wear a little sundress, because it’s just too hot and humid for anything else. In the evening I usually wear some kind of thin/flowy pants or a long dress. They have a lot of cheap pants and dresses in the souvenir stalls all over the island. So don’t worry if you can’t find anything before you go 😉 Hope this helps, have a great time! Hi there! Amazing post, thanks for all the tips! Curious about transport options – we are too nervous to ride a scooter; did you see many taxis available? In other parts of bali, the blue taxis are everywhere…curious if they have a presence in Ubud. Thanks! Thanks Diana 🙂 I haven’t got any experience with taxis in Ubud. We used private drivers and Uber when not driving ourselves. But there were always people on the street asking if we needed a driver, so transportation is not hard to find. Quite cheap as well, as long as you remember to bargain! I loved Ubud. The ridge walk is fun, the dance show is amazing and the riceterrace and waterfall are beautiful. I travel to ubud tomorrow & I feel confident with your informative experience! Been living in Bali and never bored visiting this place, looking forward to see more of Ubud. Lovely post! Those cooking classes look amazing. I wish I would have found your post a bit earlier because we’re atm in Bali but have booked a hotel that’s located in Jimbaran. However, we’re planning to do a one-day-visit to Ubud so I’m sure you’re tips will be helpful then. 🙂 Ps. Pinned this in Pinterest to make sure I won’t loose it! I am SO happy that I discovered your blog!!!! My boyfriend and I visited Ubud for just one day and I can’t wait to go back and stay longer. We plan on going back in April ! Bali really is a magical place :))) I’m hoping after a year of blogging I can retire there hahaha!! Thank you for such a lovely comment, Laura! It’s great that you’re going back, Ubud is amazing. Early Bali retirement sounds like a plan ? 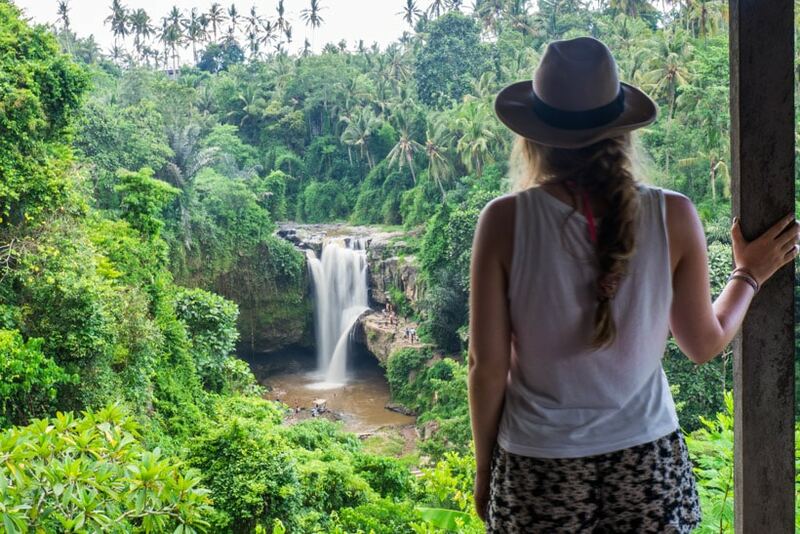 Just a tip, if you are booking on-line without seeing a place…..Ubud, because of it’s lush green and rainy weather, creates a lot of mold and mildew. So if you have asthma or other breathing difficulties….make sure to ask for a room that is mold free.